Thinking about buying a macro lens for the first time or thinking about upgrading soon? Instead of comparing a big load of specs and lens photos lets look at some real world images to help you decide on a lens. To see what effect focal length would have on the subject and the background I made this series of images with 3 different lenses, 180, 150 and 50mm. To keep the subject size constant the camera and tripod was moved closer for each lens change. F/7.1 was used to make all of these images. 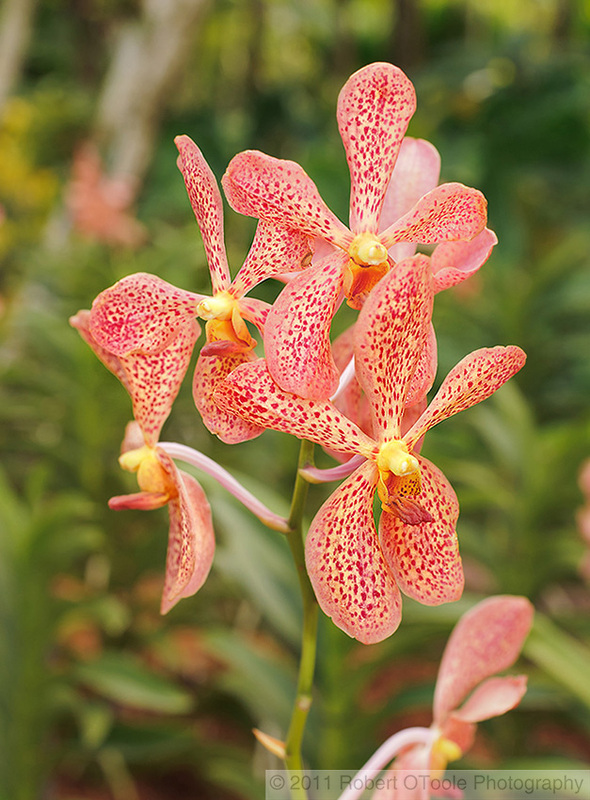 Orchid at 180mm, National Orchid Garden, Singapore. NIKON D700 and Sigma 180mm f/3.5 EX DG IF HSM APO lens, 1/125 sec at F7.1, manual metering on zero, ISO 640. Image Copyright 2011 Robert OToole Photography. This image was made with a 180mm macro lens, my personal favorite. The sharpness and bokeh, aesthetic quality of the out-of-focus areas, are extremely good. The long working distance (distance to the subject) allows you to stay farther away from the subject with the 180. This makes lighting easy and helps keep you safer if you are photographing something that can bite or sting. Making this orchid image was easy and I was able to photograph from about 4 feet away! The 180's small angle of view makes it easier to keep the background clean and free of unwanted objects compared to a shorter focal length lens. In terms of sharpness I find the 180 sharp at all apertures and works very well with 1.4x, 1.7x (Nikon only), and 2x teleconvertors/extenders. 180mm is a popular focal length and available from almost all the major manufacturers (Nikon makes a great 200mm f/4 macro). How does the 180mm compare to a 150mm lens? 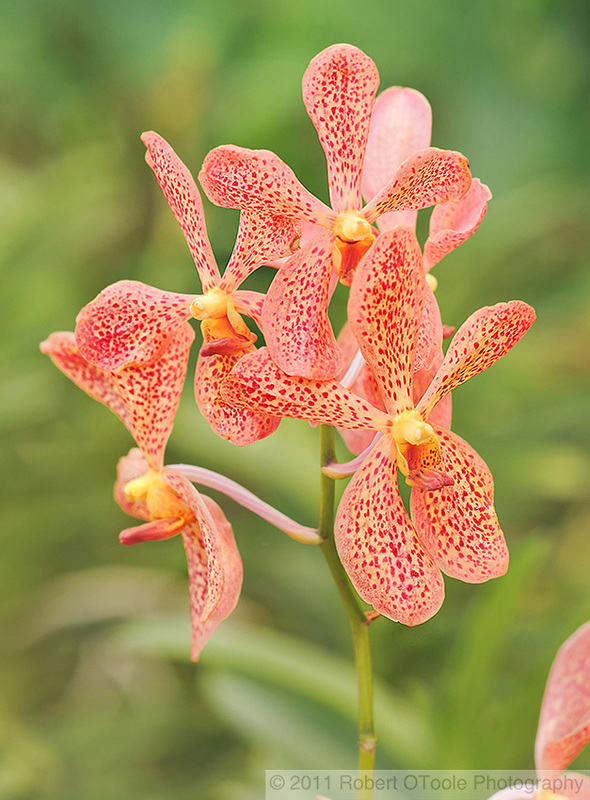 Orchid at 150mm, National Orchid Garden, Singapore. NIKON D700 and 150mm F2.8 EX APO DG HSM Macro, 1/100 sec at F7.1, manual metering on zero, ISO 640. Image Copyright 2011 Robert OToole Photography. The 150mm is extremely sharp, light, compact and works great with teleconverters. This is the lens I usually reach for when I am packing for a trip. Using this lens in the field was a pleasure, the working distance for this image was a respectable 3 feet. Sigma is the only manufacturer that makes this focal length but I would not hesitate to recommend this lens to any camera owner regardless of brand. This is not the stabilized version of the 150 macro and unfortunately I have not had a chance to use the new OS version of this lens. I have heard good things about the Sigma 150 OS and I look forward to getting to try one in the future. Orchid at 50mm, National Orchid Garden, Singapore. NIKON D700 and 50mm F2.8 EX DG Macro lens, 1/100 sec at F7.1, manual metering on zero, ISO 640. Image Copyright 2011 Robert OToole Photography. The 50mm macro is a good all around lens and is reasonably priced when compared to other macro lenses. The biggest strength of this lens is the size and weight but the focal length is just too short if you are photographing small subjects especially small moving subjects. This lens was my least favorite to use since it was so difficult to use in the field. The camera was only about 1 foot away from the orchid when I made this image so it was hard not to block light and to position the tripod. Orchid at f/7.1 with 180mm, 150mm, 50mm macro lenses. Image Copyright 2011 Robert OToole Photography. When I made these comparison images I did not exactly know what to expect and I was shocked to such a big disparity in background quality between the 180 and 150 images.What do you think? The 150 image above looks sharp and the background looks good but compared to the 180 image there is no contest. For a nature / wildlife photographer I would rate the 180 by far the best in terms of image quality and ease of use in the field. Even though I own all three of these (and a 105 macro) I always choose the 180 when I go out to do macro photography and the 150mm when I travel. Most modern macro lenses on the market today are comparable but make sure you choose a lens with an ultrasonic motor, called USM, HSM, or AF-S. This gives you a huge advantage when photography anything in motion, this is very important even in macro photography. I hope this information images helps you decide on a macro lens or maybe even make you think about upgrading to a longer macro lens in the future. I did not include a 80 or 105mm macro in this comparison but based on experience I would put this range in between the 50 and 150 but nowhere close to the 180. Don't forget that when you change camera sensor types, full frame to DX for example, the effective focal length will change but the lens angle of view will not. If you plan to use teleconvertors or extenders with your macro lens make sure you check with the manufacturer. Some lenses like the Sigma macro lenses used in this comparison only work with the manufacturers own lenses. A Nikon teleconvertor will not work on the these Sigma lenses, but the new Sigma 150mm OS lens does work with the new Canon extenders. Unfortunately one lens I used to make this comparison, the Sigma 180mm is discontinued. I hope Sigma replaces it with a 180mm OS macro in the future. Another factor to consider when deciding on a focal length is that modern internal focusing auto focus lenses will actually shrink as they focus closer even if the physical length remains the same. This is due to IF lens design, they shift lens elements or element groups within the lens as they focus closer. So a 200mm lens is not a 200mm lens at a close focus distance. Nikon actually published this data for the old 200mm F/4 micro-Nikkor macro lens, this lens would shrink to 140mm at 1:2. The new Nikon AF-S VR 70-200mm 2.8G ED II shrinks to 160mm at 1:18.